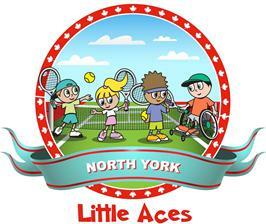 The North York Tennis Association is pleased to be offering the Little Aces Progressive Tennis program. We are partnering with Tennis Canada, the Ontario Tennis Association, Toronto and Catholic School Boards, and many community organizations to help introduce affordable and accessible community tennis programs. May 2011, we hosted a successful launch for the North York region at the Oriole Community Centre. Over 700 children and their families were introduced to Progressive Tennis! The agenda included a BBQ, games, family activities, free tennis lessons, mascots, special guests, prizes, exhibition matches and free t-shirts for junior participants. After the launch, the committee reached out to the schools and community centres in our area and distributed age appropriate equipment (including nets/rackets & balls). In addition, tennis professionals regularly visit the schools to demonstrate Little Aces Progressive Tennis. In the spring of 2012 the NYTA committee developed a Little Aces club model that was rolled out successfully. Tennis clubs were encouraged to host their own event and won a grant to help cover their costs. This would help encourage new membership and again introduce children to the sport of tennis. Due to its success, we continue to utilize this model in our community. In the fall of 2012, Little Aces Leagues were developed to create another pathway and learning venue for young children. These leagues continue to be offered in several locations in schools and community centres. The Little Aces Progressive Tennis initiative will go a long way to help introduce North York families to this great lifetime activity.